How do calories work and why are they so important? Calories are misunderstood. We know they affect our weight, but we don't quite get how. Some remarks I've heard about calories include-- Do drinks count?-- I know to lose weight I need to eat under 1200 calories.-- If I exercise it affects the amount of calories I can eat?. My personal favorite- "I can eat whatever I want because I exercised today!" I told you I had an affinity for peanut butter and ice cream! This is your basal metabolic rate. BMR is how many calories your body needs to do nothing but sit all day long. Pretend your BMR is 1500 calories a day. Your body needs those 1500 calories to operate your daily bodily functions (breathing, digestion, etc.). When you are active you raise your caloric need. Let's say you exercised and burned 200 calories. Using those same 1500 calories, your caloric need is now 1700 calories for that day. Count calories is like balancing a checkbook. To maintain weight you want each day to balance at ZERO. 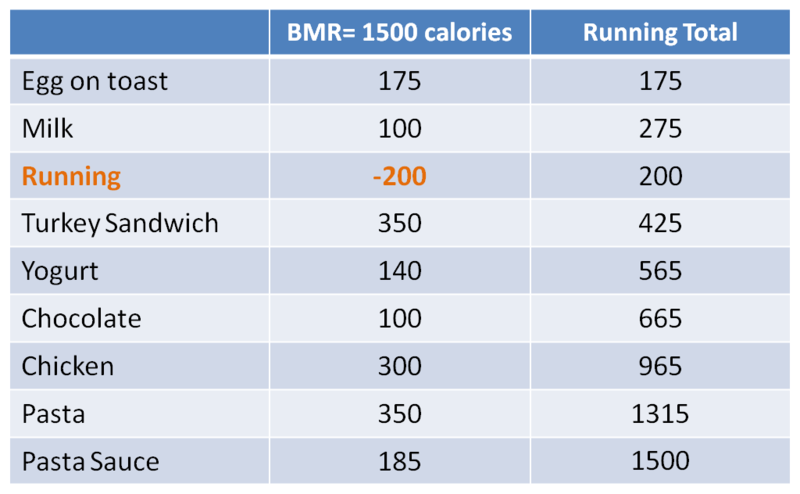 Each day's BMR is the same and your calories start at zero. You add your calories from food you eat and subtract calories burned during exercise. (See picture above) Those additions and subtractions should equal your BMR at the end of the day. Perfect! Balanced means you maintain your weight. Write it down! When you write it down you are physically, mentally, and emotionally accountable. It hurts to write 3500 calories after devouring a pizza. Typing it into an app can work, but you need to actually do it, every day. "Counting" in your head just doesn't cut it. Find your BMR. Write down your calories eaten and burned each day. Watch your progress. Reach your goals! What do you want to know to find your fit? Tell me in the comment section or e-mail me to see it in a future blog. Want Finding Fit delivered to you each week? Subscribe or Follow by E-mail.